frike | frike with meat. •	A cup of frike. •	A tablespoon of ghee. •	A tablespoon of chopped into slices butter. •	2 1/2 cups of chicken or meat soup depending on the choice. •	For decoration: •	Cashew •	Almond and pine. •	Fried peas ( to gain a better flavor and a nice color). •	Boil the meat or chicken according to the common way after cleaning it. •	Clean frike well by washing it with water several times then add it and put ghee on heat, and after the ghee gets hot, add frike and flip it for 15 minutes with adding butter pieces. •	Add the hot soup ( it must be at boiling degree) and leave it for 15 minutes on heat ,then reduce the heat and put a woolen cover on it for an hour at least. Consider not to stir frike for all the time it is covered. 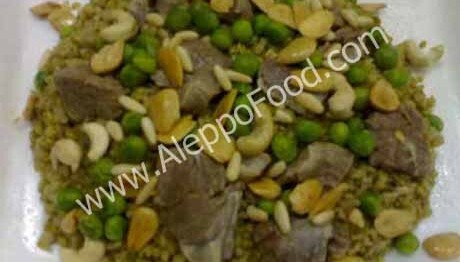 •	Fry nuts and peas, decorate the surface of frike with them , and you can cover its face with a thin layer of spiced rice before decorating it with nuts or peas. •	Serve frike with yoghurt with cucumber salad or any other normal salad.